As the 19th century was coming to a close, there were many in Ireland who recognised that the Irish language (Gaeilge), was in danger of being lost. The language had been in general decline since the start of the century, and before, but it was the death toll caused by the Great Famine of1845-1849, the epidemics of cholera and typhus and the great wave of emigration of those trying to escape, that finally broke the camel’s back for the language. For those who remained in Ireland, Irish was recognised as an impediment to social advancement. It received no official recognition nor protection from the government and if there was no overt persecution of the language, neither was there any sympathy towards it. In an attempt to stem the ever rising tide of Anglicisation of Ireland a group of enthusiasts gathered together to form a society that would redress the situation. The group, whilst mainly nationalist in outlook, was non-partisan and non-sectarian and was to attract many members of the Unionist community. The preservation of Irish as the national language of Ireland and the extension of its use as a spoken language. The study and publication of existing Gaelic literature, and the cultivation of a modern literature in Irish. The founding members of the Society were Douglas Hyde, LLD. (1st President of the League) Charles Percy Bushe, James M. Cogan, Rev William Hayden S.J, Martin Kelly, John McNeill, Patrick O’ Brien, T.O. Russell and Patrick J. Hogan. 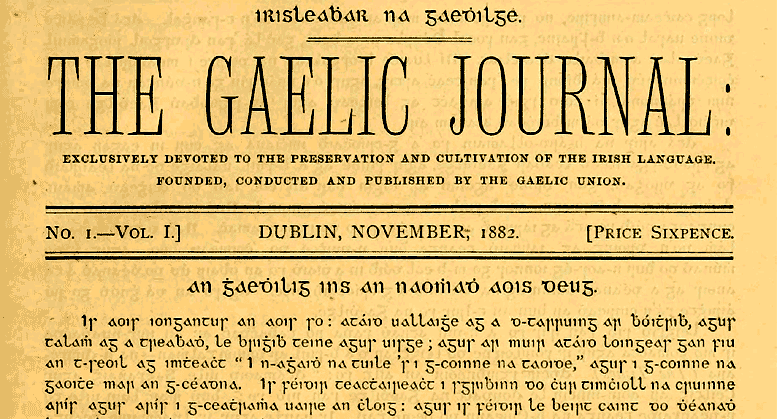 The Gaelic League started to organise language classes, not just in Dublin but throughout the country. It published tracts and initiated debates and lectures. Its voice-piece was An Claidheamh Soluis (the flaming sword). By 1903 the League had 600 branches and through its influence the language was introduced to 1,300 national schools. Douglas Hyde (1860-1949) was the son of a Church of Ireland cleric from Sligo and an ardent Gaelic Scholar and writer. He later went on to become President of Ireland 1938-1945. Hyde believed emphatically that the League should be totally free of politics and open to people of all shades of political and religious opinion who wished to see the survival and revival of the Irish language. He resigned his presidency of the League in 1915 protesting against a shift towards a more militant outlook. Eoin (John) Mac Neill (1867-1945) was to become the first editor of the Gaelic League’s newspaper An Claidheamh Soluis. He was from Glenarm in County Antrim and a respected professor of ancient and medieval Irish history. Mac Neill went on to help found the Irish Volunteers in 1913 and was instrumental in organising the Easter Rebellion 1916. However he issued orders to call off the rising when he received news that Sir Roger Casement had failed to land German guns in Kerry. He was inactive during the rising but was still imprisoned and sentenced to life. After the war of independence, he supported the Treaty and was appointed minister for education in the Free State government. He was the Free State representative on the Boundary Commission in 1925. This turned into something of a fiasco and was to be the end of his political career. Modern Ireland 1600-1972. By R. F. Foster. Penguin Books London. 1989 edition. The Course of Irish History By T.W. Moody & F.X. Martin. Mercier Press. Dublin 2001 edition. The 1916 Rising: Personalities and Perpectives. An online exhibition by National Library of Ireland website.